1.1 The initiative involved Daventry District Council and the six other boroughs and districts of Northamptonshire that form the Northamptonshire Waste Partnership (NWP), along with Northamptonshire County Council. Using funding from the East Midlands Centre of Excellence, NWP jointly procured route optimisation software with the objective to increase the logistical efficiency of the routes used for both the collection of domestic waste (commercial waste is collected by a private contractor) and recycling by the local authorities in, Northamptonshire, thereby reducing fuel usage, carbon emissions and the costs of the,services. 1.2 Through optimising the routes, Daventry District Council has been able to reduce the annual overall distance covered by the refuse vehicles by around 600 to 800 miles or 25 to 33 percent, with a corresponding CO2 emission reduction of 40 tonnes. In addition, yearly savings of over £200,000 have been achieved as a result of optimisation, at a time when local authorities in the UK and beyond are under increasing pressure to avoid wastage of taxpayers’ money and to find innovative ways to cut spending whilst maintaining essential services. 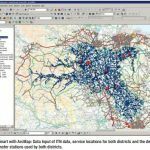 1.3 The local authorities in NWP are now exploring other uses for the software, including optimising street cleansing and road gritting routes, in order to make the most of their purchase.